In a random household in Anywhere, USA, you may overhear and eavesdrop on a couple married for 20 years having another argument about some hurt feelings between the two of them. The wife expresses to the husband how he had hurt her, and in a rush to get on with life and get the wife out of his hair, he apologizes and asks for forgiveness. The next day, the husband angers the wife again, and she brings up the fight from the day before. “I thought you forgave me,” he says as their voices escalate. A month goes by before the friends talk again, and when they do talk—at a dinner party of a mutual friend, things are a bit cold between them. There is small talk, but the intimacy seems to be lacking. In a third household, an adult child, a daughter, sits her aging mother down and explains how badly she, the daughter, feels when her mother talks to her in a mean tone. The daughter explains how the whole family is upset with the tone, not just her, and that she won’t take anymore of it, and that her mother needs to apologize. The daughter realizes that Mom never knew she was being offensive, and she excuses her for her oversight, hoping that the next time they interact, Mom will know better. 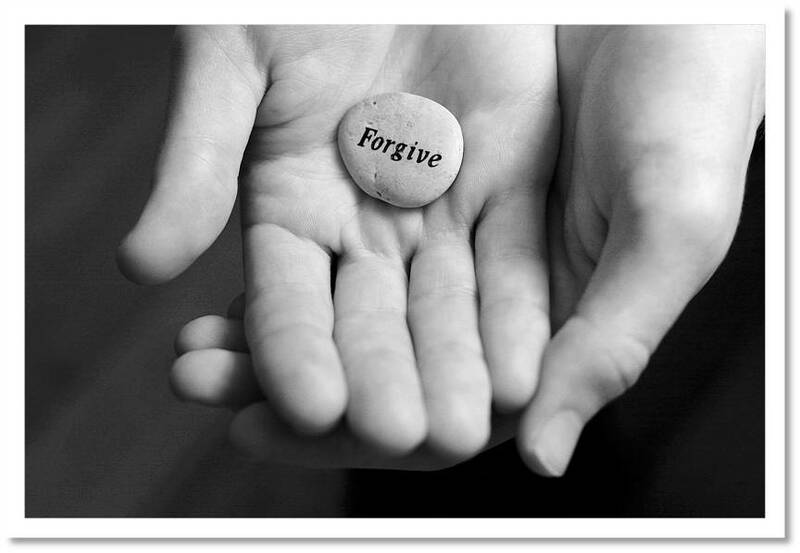 Such are several examples of forgiveness gone terribly wrong, and yet forgiveness is so important! “Forgiveness,” writes Nicholas Wolterstorff, ‘Is God’s love manifested in our midst, and is a fundamental component of the Christian vision.” Forgiveness is critical in our relationships with one another, as is asking for forgiveness, asking someone for an apology, and receiving or giving forgiveness. But too often, we get forgiveness wrong too. Over the past month, we have been looking at the gifts that God gives us and in turn looking at creative ways we can give gifts to others this holiday season. With Thanksgiving upon us, we are nearly at that time when we will sit down with friends and families, enjoy a meal together, but also realize that there may be unfinished business in our relationships when it comes to forgiveness and matters related to interpersonal conflict. God gives the gift of grace; God gives the Holy Spirit; God gives abundance in times of scarcity, and God also gives the gift of forgiveness…But like the examples I just gave, many times forgiveness goes awry. Let’s take a closer look at God’s gift of forgiveness today. I want to start off by reminding you of something we talked about in last week’s sermon, in which I was arguing that God’s power is made perfect in our weakness. I used a pitcher to illustrate how many of us live and interact in the world with our loved ones by pouring into others: we give and we give, and soon, if we don’t connect with God, we run dry—our cup overfloweth, but there is nothing to refill it! I also then used a towel to wipe the pitcher clean after the last drop fell, and mentioned briefly that its at that point, when people take and take and take that resentment or guilt sets in. We either feel taken advantage of, or we feel guilty that we have failed someone, and so what is there to do? I’m not sure if I agree with that entirely, but maybe we need to give forgiveness a second look just in case! Perhaps many of us run on “Empty” and have resentment because we have either failed to ask God for forgiveness or haven’t received God’s forgiveness. We are all in need of forgiveness because we are all sinners, whether we think it or not. I once had a dream in which an older woman, a sage of sorts, told me that I was a divided person, that I had lived a double life and that one of those lives was a lie. When I awoke, I was a bit frightened. It was as if that sage looked deep within my very life, my heart, and revealed my weakness and brokenness for what it was. Sometimes we put on a show for others, when pain lurks just below the surface. A great author once wrote that we all have another person living inside us all, one who is both strange and familiar, and that sometimes that other person gets his way. We become a slave to ourselves and find it hard to get by in life. We are noble creatures, all of us, yet full of anxiety; we are resilient, but fragile. All of us wrestle with ourselves, and sometimes we lay siege to ourselves only to find that we give up or give in to the war that wages within our hearts. I can relate to what Paul wrote to the churches in Rome, when, in a great moment of vulnerability and confession, he wrote, “I do not understand my own actions. For I do not do what I want, but I do the very thing I hate” (7:15). I have a feeling that forgiveness of others is difficult or doesn’t work at times because we don’t know how to forgive. If we recall the three situations at the beginning of this sermon, we can see that we need to understand what forgiveness isn’t before we can clearly discuss how to forgive others. Forgiveness, for one, does not happen when we hold things against people. Some of us do this by saying, “I forgive you, but I won’t forget!” This is natural, and actually I’m not going to tell you that you need to forget the sins that people have committed against you. In fact, it is unhealthy to forget those things that people have done, for we all must confront injustice, make things right, but also help those who wronged us take responsibility for their actions and encourage them to condemn those actions as well. We need to encourage people to own up to those mistakes, and repent for them as well. We need wrongdoings ever before us because we need to learn from our mistakes. If we forget the mistakes we or people make, then we’ll just repeat them again. But neither can we hold someone captive to wrongdoing if you’ve already forgiven them. Freedom only comes when we free the other person from their sins—we condemn injustice, but we bear witness that the other person is not defined by that action or injustice. We need to let people grow and learn and make mistakes, even if those mistakes are repeated now and then. Forgiveness happens when we give room for a person to repent and to walk through that process of reconciliation in community and accountability. But downplaying hurts and conflicts actually creates more resentment and really devalues the other person and the relationship. We need to take conflict seriously, we need to take people seriously, we need to take our own responsibility in conflict seriously, and we need to take forgiveness seriously even if it doesn’t seem like a big deal. I think this is why Jesus tied our forgiveness of others with God’s forgiveness of us: Conflict and sin and mishaps and miscommunication take their toll on relationships, and God is ultimately concerned about our relationships. Have you ever had a friend with whom a conflict happened, and you both chose to downplay the situation rather than confront it, seek reconciliation and enact true forgiveness or apologies? Yes, you may be cordial, and you may even spend time together, but there will always be that wound, ever so subtle it may be, just below the surface. Making excuses rather than confronting conflict only forestalls forgiveness and weakens the bonds of friendship, marriage, and families. Forgiveness happens when we take conflict seriously. Forgiveness, thirdly, does not happen when we fail to take responsibility for our own actions and ask forgiveness of others even if we think we’re not in the wrong. To “forgive our debtors” means that we need to move away from these false notions of forgiveness: We cannot hold people in contempt, we cannot downplay conflict, and we cannot fail to take responsibility for our end of the relationship. You may want to wrap this forgiveness in different packages: It may come in the form of a phone call, or a letter, or perhaps over coffee. It may come with many tears or even some awkward silences, but you can’t help that. All you can do is obey God the best you know how.